This is the Snap Circuits Extreme by Elenco?? Electronics. 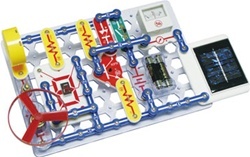 FEATURES: This educational lab kit is a Dr Toy winner! Easy to identify color coded parts. conventional science and engineering labs. of the 750 projects you can do. Voltage is low so it's very safe! CD containing more than 50 computer interfaced experiments.